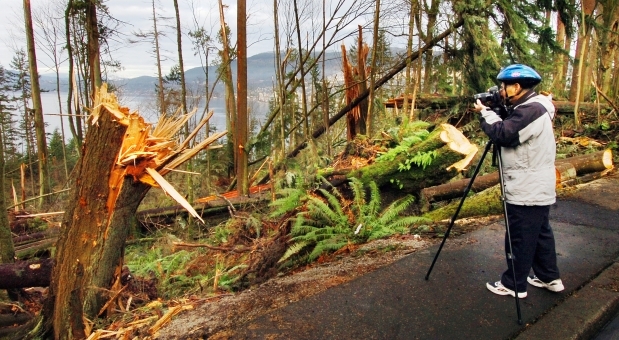 Ten thousand trees were knocked down in Stanley Park during a devastating windstorm in 2006. Invasive, non-native plants flourished in the wake of the big blowdown. The 500 volunteers in the Stanley Park Ecology Society have been diligently working with Vancouver park board staff to uproot the invaders and replace them with native plants. But it costs money. And Monday, they got some from the Stanley Park Brewing company, which donated $20,000. The donation comes from a limited-edition pale ale called Windstorm, which was named after the natural disaster in 2006. “We introduced this new beer as a limited-edition offering where partial proceeds from every sale is being donated directly back to the Stanley Park Ecology Society,” said Jim Lister of the Stanley Park Brewery at a news conference in the park Monday. Patricia Thomson of the society said much of the money will go into the perennial problem of invasive species.